The 2019 Simon Winkley Pro Coaching week to Alacati, in the beautiful flat water bay, with superb conditions and launching right in front of the centre. This will be an incredible week of intermediate to early-advanced coaching with typically strong cross-shore wind in a stunning windsurfing location. That means a focus on real-world core skills to include getting up to speed, harness and footstraps, tacks, gybes, carving skills, confidence-boosting and more. Places are limited so book early to avoid disappointment! To really benefit from this clinic you should be at least at the level of early beach starts and use of harness. At the higher end, even if you’re waterstarting, blasting and developing carve gybes then there will be loads of improvements that Simon can help you with as well as new ideas and moves to try. As long as you can leave the shore and return back to where you left off, you'll be able to join the group. The levels and abilities will then be split into smaller groups, so that specific topics can be covered to suit your requirements. If you have any concern about your level for the week give us a call and we will be able to help guide you to the best week. Flat, shallow areas with crystal clear blue water, Alacati is an easy, safe place to windsurf. The launch area has next to no shore break and you are immediately into a huge shallow windsurfing area. Allowing you the luxury of being able to stand 250 metres out from the shore. So resting and practising all those skills is very easy. Plus you have a full service centre, with restaurant and changing room and faciliities on the spot, so you can head back up for a refreshment or break in between sessions on the water. Simon chooses to go at the end of June and beginning of July because the wind has proved to be just as good as in late July/August, but the water is less crowded. The pre-dominant Meltemi wind blows port tack (left to right across the beach). It's lighter in the morning and builds in the afternoon.During this time you should expect to get a variety of conditions, perfect for training, using sails ranging from 4.7m-7m, on a typical Alacati day you'd be on 5.5m. If you are unsure about what board is right for you, we are only to pleased to assist you in that choice. Simon will make recommendation for the local conditions depending on your weight and ability. If you need to speak with Simon regarding your choice of board give us a call and we will put you in touch with him. You can book the standard Sports pool boards or newer Pro Pool boards for a small fee to upgrade. If you wish to cover against any damage, you can pay lthe local fee of Euro 45 per persons which covers most damage (except fins and negligence). Despite the hot temperature on land, the water is slightly cooler than you might think due to a local spring in the bay. This means it’s advisable to wear a shortie wetsuit or 3mm summer suit. It’s also wise to take a pair of surf shoes. Most places take credit cards and the local currency is still Lire, and you’ll get a much better exchange rate in Turkey rather than Gatwick. Mobile phones work and there is WiFi at the windsurf centre where the course will be based. 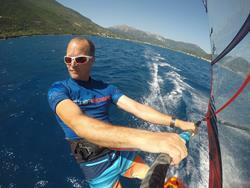 - 5 days Simon Winkley windsurfing clinic. - 1 week windsurfing equipment rental (JP/NeilPryde - sport pool). - 7 nights BB at Hotel Ileri in twin room on shared basis. - Return Izmir group airport transfers. - Daily group transfer to/from windsurf centre. Flight Inclusive from £1,249pp sharing a twin room (2 persons maximum). Flight Inclusive from £1,399pp in a single room on single occupancy basis. Equipment damage insurance - payable locally at the centre on arrival Euro 45 cash. The windsurfing centre is locatedo on the best launch position on the bay, with changing facilties, bar, restaurant and spacious chill out areas. The centre can help you with rigging and getting the equipment in and out of the water. As there is a slight incline you might like to bring some surf shoes. Alacati offers a range of watersports such stand up paddle boarding, boat and sailing trips from the nearby marina, beach volleyball, yoga or pilates excercise classes, gym equipment plus a sociable area at the centre with bar and restaurant. There are also excursions available for those not windsurfing including historic sites or local thermal spa. London Gatwick/Izmir (regional flights available*) including 1 x 20kg hold bag. Transfer: approximately 1 hour from airport to hotel. *Regional flights are available which may include a surcharge. Alacati offers easy, flat, shallow water which is ideal for improvers to advanced intermediate windsurfers. If you're looking to improve your windsurfing, skills training get some video feedback and a very enjoyable week on and off the water, both for clinic and non clinic participants, this destination offers a superb week. For accommodaiton, the Ileri Hotel is a simple, nicely decorated 3* family owned hotel that is situated in Ilica. The owner Murat, has been receiving clinic and windsurfing groups from Sportif for many years. Murat, his family and staff offer a warm welcome Sportif clients. The Ileri has a small Turkish Bath and spa pool, friendly bar and lounge area. Staying at the Ileri Hotel, you are able to walk out to a choice of restaurants and close to Alacati old town, so great for socialising in the evenings at a reasonable price for dinners. Best Time: Mid June - Mid Sept.
in front of windsurf centre. side shore from left (right in the spring/ autumn). Wind Type: Combo of northerly meltemi and thermals (summer). World class PWA slalom windsurfing venue. Kitesurfing and SUP available in Alacati bay. Great family holiday destination with kids clubs. Safe learning bay for children and beginners. Choice of restaurants and bars in Old Alacati town. Superb historical sites and excursions. Luxury All Inclusive and boutique hotels on the spot.